Live From Langley, B.C. : Vineyard Music EXTRA! This collection features the talents of Brian Doerksen, Scott Underwood, Michael Hansen, and Cindy Rethmeier. 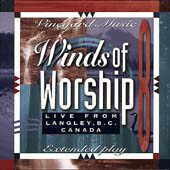 Doerksen, best known for the classics of Light the Fire Again and Eternity, brings this set from The Kingdom is Now conference held at the Langley Vineyard together featuring not only Vineyard worship leaders but some of Doerksens students at his school for worship leaders. This collection has its share of remakes including Faithful Father and I Lift My Eyes Up. Scott Underwood, whos Hop on the bus was covered by Brian Doerksen on Faithful Father shares the vocal duties on it here. His latest Jehovah Never Sleeps is a blues rocker and even though he apologizes to God for singing the blues in church gives praise a new a new medium to work in. His blues styling following the Vineyard writers Danny Daniels and John Barnett. A softer version of Jehovah Never Sleeps appears on You Are God. Cindy Rethmeier who has been spending more of her time working with childrens ministry recreates her I Want to be Like Jesus title song from her childrens album. Backed by Daphne Rademaker on keyboards this song is a contagious worship song for any child of the King. Michael Hansen is part of Gods Country worship group that released the set Real Love in 1995 is featured here on the Vineyard classic Exodus XV. Andrew Smith who is the worship leader on I Will Lift My Hands is represented here with Our Father and Not be Shaken both written by Norm Strauss . Underwoods Greater Grace originally on Hallelujah Glory is even more powerful on this set. I recommend this CD for anyone who appreciates the Vineyard music or any newcomer to the power of praise and worship this group possesses.